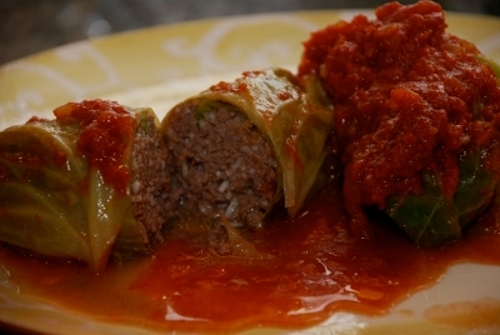 Like many dishes, Italian Stuffed Cabbage Rolls can be made in a variety of different ways. I grew up loving love my Mom's Cabbage Rolls, but this recipe is a nice alternative. Since I enjoy trying different varieties of food, I though it was time to try to put together an Italian version. What makes this recipe tasty and delicious are the combination of well seasoned ground beef, veal and pork. I usually use just ground beef when I make cabbage roll, but by using three different meats you will take this recipe takes to the next level of flavor. In my Mom's recipe regular green cabbage to create this dish but for the Italian I use Savoy cabbage which is sweeter and milder in flavor than green cabbage. The sauce for the Italian Stuffed Cabbage Rolls is plain and simple. The combination of tomatoes, Worcestershire sauce and beef broth cooked with the seasoned cabbage rolls createds a create a light flavorful sauce. Enjoy! Carefully place the cabbage in a large pot of boiling water. Remove the outer leaves as they become tender being careful not tear them. In a large bowl mix together the meat, rice, butter, parsley, eggs, garlic, Worcestershire sauce, tomato sauce, salt, pepper and paprika. Start to pre-heat the oven to 350 degrees. Take a handful of meat and roll it into a small log. Roll the meat up in the cabbage leaves while tucking the sides of the cabbage on the inside. Repeat until all the cabbage and meat is used up. Place a lining of extra cabbage leave in the bottom of a casserole dish. Sprinkle the tomatoes with some of the basil and oregano. Place a layer of cabbage rolls on top and repeat with the onions and tomatoes. Add the broth and cover with any remaining leaves. Check to see if it’s dry or not. If so add some more tomatoes and broth. Cover and cook for one more hour.